The final week! 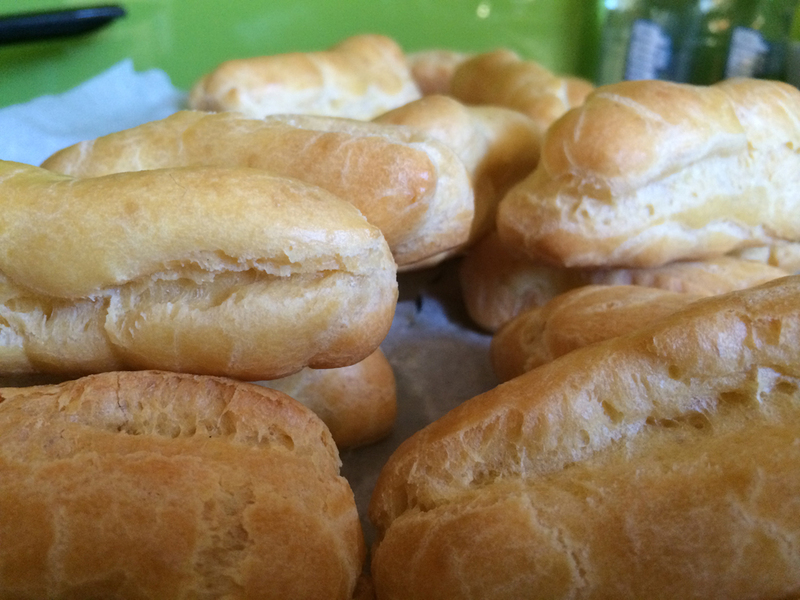 This week we had the challenge of making eclairs. I had never made eclairs before so I was a little nervous. Once again it was Pinterest which provided some good ideas for me and I ended up going with a Pistachio Eclair. Not one to make things easy on myself, I made my eclairs from two different recipes. For the choux pastry and the pistachio paste (for the cream) I followed the recipe from The Candid Appetite. It had a number of good tips on making eclairs as well, which I definitely took note of! For the ganache and pistachio cream I turned to The Little Loaf. 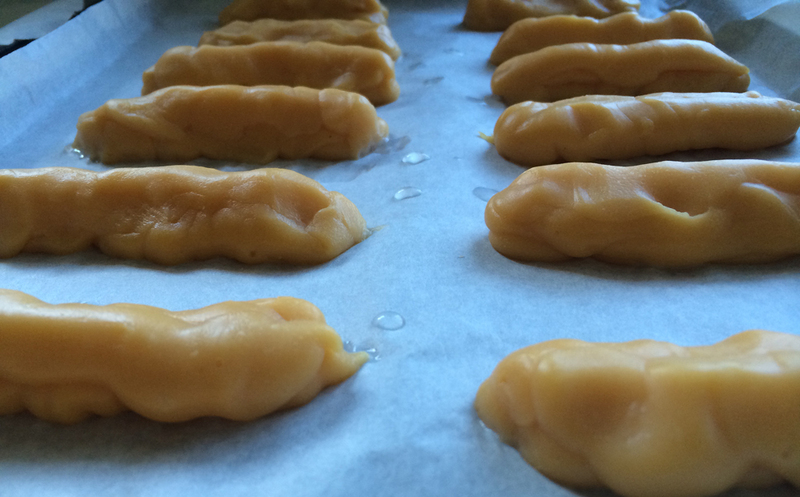 Piping the eclairs was actually the hardest part, not making the choux pastry. As you can see mine looked a bit ugly. In piping it, I had to go over each many times, which caused a lot of cracks (and a lot of sore muscles the next day). But when they came out of the oven they looked like really nice bread rolls. 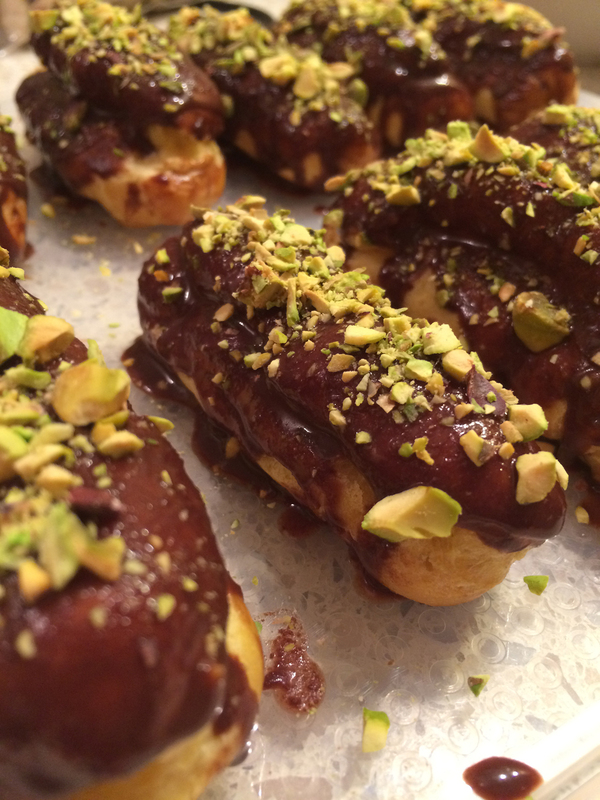 With ganache and a sprinkling of pistachios these eclairs looked amazing. I also had a few issues with the cream. First with making the pistachio paste – I don’t actually have a food processor, I only have one of those magic bullet things which didn’t do a very good job of blending the nuts. It resulted in quite a thick cream and also a few big chunks left in the mixture, which ultimately became a nightmare of piping the cream inside the eclairs. Basically, I couldn’t, due to pieces of pistachios getting stuck in the nozzle. I ended up having to cut them open and spoon the cream inside. After that, they looked a bit ugly. I believe the cream was my undoing as the eclairs did not go down well with my colleagues. I came last this week. So I said goodbye to first place. I definitely want to try making eclairs again, but I think I will be doing a chocolate cream next time to appeal to the masses. But overall I think I did pretty well, not having my own kitchen and all! Making meat or vegetable pies this week was a nice break from all the sweetness we’ve had over the last few weeks. I don’t think I had ever made a meat pie before. I guess I’m not a huge fan of working with pastry or really been equipped to make it, but I was up for the challenge! I kind of didn’t know what type of pie to make. There was a lot of thought and a fair bit of googling to figure out what I wanted to do. But I had a thought to make pies using the pork ball recipe from the Healthy Food Guide. The pork balls are a favourite of mine. They are delicious and really easy to make. And healthy to kick! I had an added challenge this week as I went up to Hawke’s Bay to see my parents and pack up all my stuff ready for moving down to Wellington. Adding this to already not having an oven in our apartment… I had to make the pies at my parents’ place in Hawke’s Bay and then transport them back to Wellington. It worked out ok. Plus I had the use of a fully stocked kitchen. I made the pork balls up in the form of tiny patties and cut the cooking time short by five minutes to ensure they didn’t brown like they usually do or dry out when they were put back into the oven in pie form. To assemble the pies I used savoury short pastry, Genoese pesto and Kapiti Pakari Aged Cheddar Cheese. I used a glass to cut out the circles for the pies. I placed one pork pattie on the base, a teaspoon of pesto and a slice of cheddar. I then placed the top piece of pastry on top and pushed down with a fork. I brushed the pies with an egg wash (1 egg and 1 tsp milk) to give a golden brown look. I baked the pies at 200ºC for between 15 to 20 minutes. By this time the pastry was looking nice and golden. They tasted delicious hot out of the oven, but as we had judging on the Monday and at work with no oven, we had to get inventive at the office. We used the sandwich presses in the kitchen, which heated up the pies well and browned mine up a bit more, which was great! I came second, which has put me in first place overall… just! The winner this week were the Goulash-pretzel pies – both by colleague votes and popular vote. Next week is Eclairs! Which I’m not really sure how I feel about making. I’ve never made any before, but they look easy enough. I’ve had a few ideas on how to make them a bit more than just a traditional eclair – pistachio, coffee or s’mores – I’m currently undecided which ones I want to make! For the second week of Wellington Bake Club we had to make veggie cakes and they did not disappoint! I perused Pinterest and googled a few recipes, and soon found a gorgeous zucchini chocolate cake to make. I amended the recipe slightly to exclude the coconut – I don’t really like coconut and didn’t think it would do much for the cake anyway. It was delicious! I will definitely be making it again. Although I need to experiment with the glaze a little bit as it didn’t came out that well. The winner this week was a chocolate beetroot cake, which was lovely and moist. It was not judged on the Monday, so wasn’t included for the public vote. This week the people’s choice winner was the rhubarb crumble cake.